Genesis books make perfect gifts. 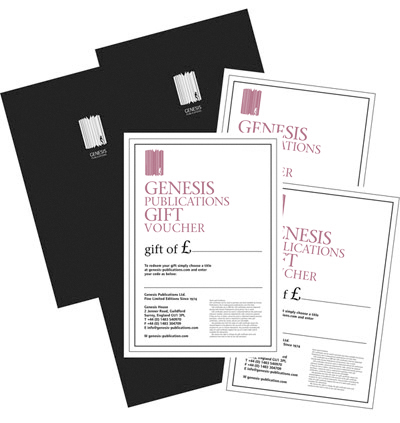 With a Genesis Gift Voucher your recipient can make their own selection from our catalogue. Their purchases will delivered by our international couriers, to any destination in the world. Above: Genesis books are courier delivered worldwide. Below: Vouchers codes are issued instantly by email, and a free Gift Voucher with guitar pick gift tokens are sent by post. Input the amount you would like to give (see below). An email confirmation is sent with your unique Voucher Code. Voucher Codes can be used either online or by contacting Genesis. The code is debited with each transaction. While the balance shows a credit, the code remains active and can be used to make further purchases either in part or in whole. A free Gift Voucher (see right) is sent by post, inscribed with your unique Voucher Code. Please enter your recipient as the Delivery Address if you would like the Gift Voucher sent directly to them. Unless otherwise instructed, your Gift Voucher will be sent to your Billing Address. 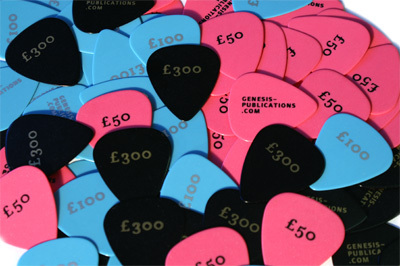 Available in three colours, guitar pick gift tokens are denominated in three cash amounts: £50, £100 and £300. Purchase a Gift Voucher and we will enclose guitar picks to the value of your gift. Remember, checkout online and you will receive a confirmation email with your Voucher Code which is immediately redeemable. Please allow 3 working days for delivery to the UK; 5 working days for Western Europe; 7 working days for Eastern Europe; 10 working days for USA, Canada and the rest of the world. An authorised Voucher Code is necessary for all purchases. Gift Vouchers cannot be redeemed for cash. Please keep your Voucher Code safe. Gift Vouchers cannot be replaced if they are lost or stolen. Gift Vouchers cannot be used or redeemed towards previous purchases, and cannot be used or redeemed to purchase another Gift Voucher. They cannot be resold, and are non-refundable.